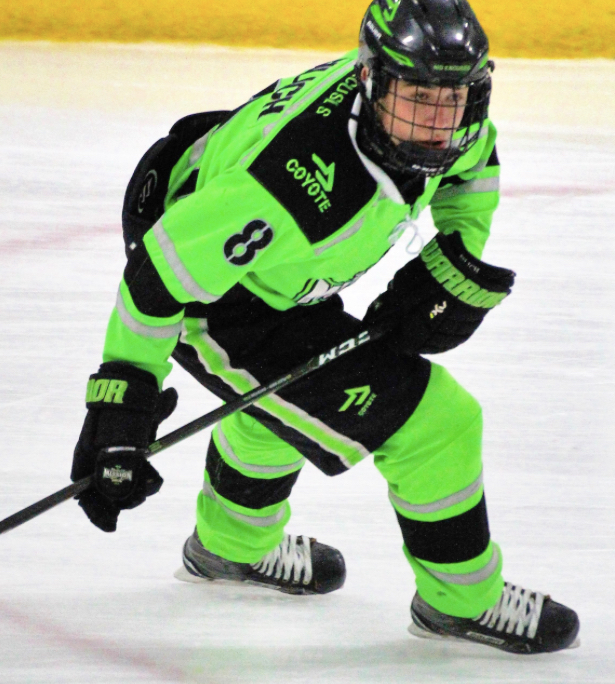 Quinnipiac recently picked up a verbal commitment from 2003 Illinois born forward Jack Silich out of the elite Chicago Mission program that plays in the High Performance Hockey League. This is breakthrough for Quinnipiac on the recruiting front as they have rarely in the past recruited players that young from elite programs in the mid-west. On the season in 42 games played, Silich has 60 points (24 goals, 36 assists). He is expected to arrive in Hamden for the 2022-2023 season. Big thanks to Jack who was gracious enough to give some of his time for a Q&A with the Bobcats Hockey Blog. Jonathan Singer: First off congratulations. When did you start playing hockey as a kid? Jack Silich: I started playing mini-mites at Glacier Ice Arena in Vernon Hills, IL at 3 years old. At the age of 4 ½ I was already playing travel mite hockey with a team of 2001 born players so you can say that I played mite hockey for a really long time. Jonathan Singer: Do you feel the success of the Blackhawks in the the last decade played a role in you wanting to play hockey in the Chicago area? Jack Silich: I started playing hockey before the Blackhawks were successful again. My family and I would go to the Hawks games and the United Center was empty at that time but I still loved watching the game. I started playing at a young age because my older brother Sammy who is a 2000 born defenseman and plays for Choate Rosemary Hall in Connecticut started to play and I wanted to play with him. So we would put on our roller-blades when we were not on the ice, set up two nets in our heated garage and play all winter long which helped me to develop my shooting & skating skills at a very young age. Jonathan Singer: Do you get a sense that the success of Blackhawks has also spurred a huge growth in terms of elite level players in Illinois with top programs such as the Mission, Chicago Young Americans and Team Illinois especially with the US developmental program having a bunch of those players there now? Jack Silich: The Blackhawks winning the Stanley Cup has definitely had an impact on the Hawks fan-base, but being an original 6 team, Chicago has always had a ton of hockey fans. The players born in 2005 and younger are probably more influenced by the recent Blackhawks success with players like Kane and Toews as their role models. My age group and older were more influenced by the quality hockey developmental programs in our area and top coaching, like Gino Cavallini my current coach who played in the NHL for many years. Jonathan Singer: Tell us about your overall recruiting process? What factors went into deciding on Quinnipiac? Jack Silich: About two years ago, Peter Alden (2006 Quinnipiac Bobcat alumni and General Manager of Elite Hockey AAA in CT) invited me to come to Quinnipiac to do a summer skate. My brother at the time was doing a skate at Brown University so it was convenient enough that my dad and I drove down and I skated with the 2002 and 2003 born players. I had a chance to meet Rand Pecknold that day and he spent 20 minutes just talking to me about where I was from and who I skated for. It was like talking to a friend. From that point on, I knew Quinnipiac was where I wanted to play. Another deciding factor for me is that I know Rand and his staff are not leaving the program anytime soon and most likely they will be there to coach me and develop me when I get to Quinnipiac and this was very important to me. I also did not want to play for a college that over-commits players, and I know Quinnipiac does not do that. So all in all the fit was right. Jonathan Singer: Did you take an unofficial visit to Quinnipiac during this process? Jack Silich: I had a weekend off from hockey and I went with my dad to see my older brother play a few games for his split season team, the New York Applecore Junior A of the EHL. We had some free time so we went to the campus and then to the Quinnipiac game against Brown. I had a chance to talk to the coaches after the game and they were so approachable, made me feel so comfortable and were very welcoming. It just felt like home and I knew then it was a special place. Jonathan Singer: Did you look any other schools besides Quinnipiac? Jack Silich: I did go on a few unofficial visits and had an offer from a Hockey East school and a NCHC school but my heart was always with Quinnipiac and the awesome coaching staff so they were always my first choice. Jonathan Singer: Tell Bobcat Nation the type of player that you are and what are some of your strengths as a player? Jonathan Singer: Is there a player out there that you try to model your game after? Jack Silich: I am a combination player in the likes of Jamie Benn, Tyler Seguin and Patrick Sharp. Jack Silich: My core body strength​​​ definitely needs to get better. Jonathan Singer: What area of your game are you trying to work on the most​? Jonathan Singer: How has the Chicago Mission program been for your development? Do you feel playing in the High Performance Hockey League along with playing other top programs is a huge thing for your development? Jack Silich: Chicago Mission is hands down the best AAA program in the country. The organization and coaches are top notch. Playing for the Chicago Mission is like being Stanley Cup contenders. Other teams want to beat you so they play their best and hardest game against you every time, so I always have to play my best game no matter who we are playing. The Mission program has high expectations for their players both on and off the ice and they always expect us to represent the organization in a positive way and be a good role model. Jonathan Singer: What would you say has been your toughest challenge you've faced as a hockey player and how did you bounce back from that? Jack Silich: The toughest challenge I have faced was when I wasn’t selected to be participant in a high caliber hockey showcase. This motivated me to work even harder than I already do . I constantly remind myself that I have to prove people wrong and continue to work hard and push through adversity. Jack Silich: My long term plan is to continue to play hockey at the highest level possible and continue to do well in school. But my main goal over the next 3 years is to train hard off the ice and continue to work on all aspects of my game. I would like to be on the team that brings a National Championship back to the Chicago Mission. Jonathan Singer: Is trying to make the United States National Developmental Program something you want to accomplish? Jack Silich: Absolutely a goal of mine is to play for the Developmental Program since it is a prestigious program that develops the top players in the United States. I ultimately want to train hard enough and be ready for the NHL draft as well. Jonathan Singer: Who in your life has taught you the most about the game? Jack Silich: I can say that both my dad and brother have taught me the most about the game. My brother encourages, teaches me and competes with me to make me a better player. My dad critiques me on what I am doing wrong and encourage me when he sees something good. Both my parents are very supportive of both me and my brother and they put us first and do whatever it takes to make us better players. The make a ton of sacrifices to allow for my brother and I to follow our dreams. Jonathan Singer: Off the ice what are some of things you enjoy the most? Jack Silich: When I am not on the ice I like to bass fish and spend time at my lake house in Wisconsin, wake-surfing, jet skiing, and boating. Quinnipiac commits Jack Silich, I have read about him and I must say he got the best skills too. So good to read about him once again.